Sikkim Teacher Eligibility Test Hall Ticket 2018: Human Resource Development Department, Sikkim has scheduled the Teacher Eligibility Test on 11th November. Aspirants who are going to take part in the Sikkim TET Examination can download the admit cards to attend the examination. The HRDD Sikkim will let the applicants to download Sikkim TET Hall Ticket from its official portal, Sikkimhrdd.org. Aspirants can visit the portal and can tap on ‘Sikkim TET Hall Ticket 2018 Download’ link to get the hall ticket. After downloading the e-admit card, candidates can take a hard copy of the admit card and keep it safe in a file to take it to the examination. The HRDD Sikkim announced that the Sikkim TET Admit Card/Call Letter link will be activated from 27th October. Hence the aspirants who are going to appear for the test will have to wait till 27th Oct to download the hall tickets. Candidates can check the hall ticket downloading process, guidelines for the examination and more details from the following article. The Human Resource Development Department, Sikkim has recently issued the notification for Teacher Eligibility Test (TET) Paper 1 and Paper 2. This examination will be held for Paper 1 (for Primary classes’ I-V) and Paper II (For secondary classes VI-VII). A huge number of candidates seeking to become primary and secondary teachers have applied for Sikkim TET examination. The HRDD Sikkim has accepted applications from interested aspirants in the months of September/October. A huge number of interested aspirants have sent their online applications through sikkimhrdd.org. Applicants of Sikkim TET will be shortlisted on the basis of Merit of Sikkim TET Exam and will get the opportunity to work in various locations across the state. Sikkim TET has announced the notification to recruit eligible personnel for Teacher Vacancies of categories, Lower Primary Classes Teachers, Upper Primary Classes Teachers, Higher Classes Teachers, Language Teachers, Specialist Teachers, and Physical Education Teachers. Aspirants applied for the Teacher Eligibility Test can qualify the test with a great determination to grab the opportunity as a primary/secondary teacher in Sikkim state. The Sikkim HRD Department has announced that the TET exam will be conducted on 11th November and the hall ticket will be made available to download from 27th October. 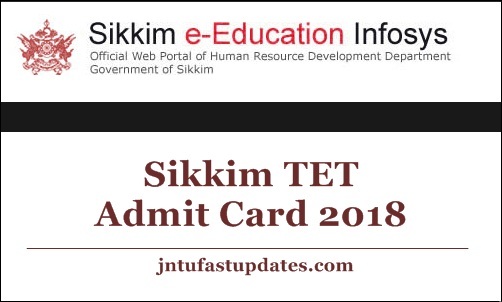 Hence candidates can get ready to download Sikkim TET Hall Ticket 2018 at sikkimhrdd.org. Hall ticket is the most important document to attend the TET examination. Without showing the admit card, candidates will not be allowed to attempt examination. Hence all the candidates attempting the examination must carry admit cards. Also, candidates need to carry any of the valid identity proof such as PAN Card, Aadhar card or any other identity proof along with the hall ticket. The identity proof will also be verified by the concerned officer at the examination center. After Downloading the hall ticket candidates can check their name, register number, date of birth, Photo of the Candidate, Mother or Father Name, Exam name, Exam Centre Name and code, Exam Centre Address, Signature of the applicant, Exam Counsellor Signature, and Important Instructions for Exam etc. Candidates can approach the helpline authorities for any necessary corrections in name, DOB, or other columns. Search the Sikkim TET Hall Ticket download link in organization website. Check the information in Sikkim TET Hall Ticket.